God is calling us to trust Him again. This time it's not about adding one additional campus. It's about funding the 2020 Vision laid out in 2017 which includes campuses in downtown Norfolk and Stuttgart, Germany. The vision that God has set before us is consistent with our four part strategy: Come, Grow, Serve, Reach. He calls us to come to Him in faith and then to grow in Christ, serve others and reach the lost. God is already working miracles in all of this. The goal for this campaign is $1.65 million which includes nearly 20% for missions and outreach. 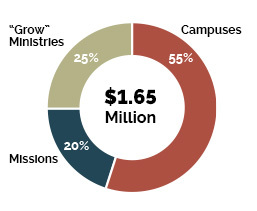 This is substantially less than the amount needed for just one campus three years ago. We are asking you to pray and sacrificially give. Let your prayers be guided by what you read here when clicking the links in the box in the right column of these pages. As for giving, we are asking you to make a two year commitment to the Vision Campaign over and above your regular giving. The Giving & FAQ page provides details on the different ways that you can invest in this Kingdom expanding work. Teaching Pastor Randy Singer shares the details about the vision Campaign and the future of Trinity Church. Trinity Church exists to make disciples who exalt Jesus Christ and honor God’s Word in all we say and do. In the past eleven years, we have seen God do more through Trinity Church than we could ever ask or imagine (Ephesians 3:21). God has guided us away from our original concept of a single site church at the Virginia Beach Oceanfront, to a multisite model we now embrace. We have become a church without walls, adding campuses so that we can reach as many people as possible and become an active part of local communities. The 2020 Vision expressed in April 2017 focuses on strengthening existing Trinity campuses as well as planting new ones (Isaiah 54:2) Even in the year since we committed to the Vision, we have seen God do great things. Now it is time to take the next steps. We again find ourselves on the verge of things that can only happen through God’s Spirit. Please pray with us as we seek to understand the will of the Father, make disciples who exalt the Son, and move forward in the power of the Holy Spirit.